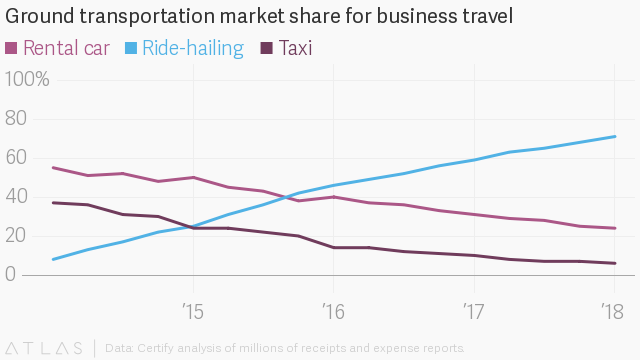 In the last ten years, we’ve seen an increase in the number of sharing economy companies. Some big names immediately come to mind like Airbnb and Uber. 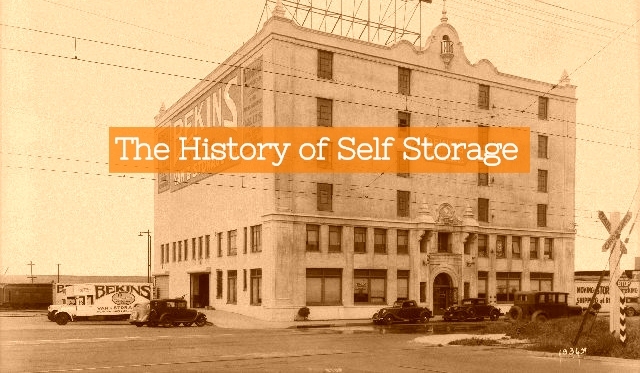 Many companies have copied the model to great success, connecting gig workers with clients for things like dog walking, grocery shopping, and storage. So, is it possible to live off the sharing economy? This is a bit of a contentious issue. Uber often comes under fire for what they pay drivers. Other freelancing sites like Fiverr or Upwork have been criticized for romanticizing hustle culture, when in fact, being a freelancer is a hard and difficult road. Perhaps the greater criticism of sharing economy companies is that those who use the platforms to make money never receive benefits. Another downside is the taxes a shared economy worker must pay at the end of the year. This makes it difficult to actually live off the sharing economy. Regardless, for the sake of a thought experiment, let’s investigate whether it’s possible to live off the sharing economy. Let’s also not worry about taxes or benefits until the end. To start, let’s divide the sharing economy into three parts. First, there are what I’d call behind the scenes sharing economy. These are sharing economy opportunities that don’t require you to actually work, instead making money off your home or car. These are companies like Airbnb and Neighbor, but also Turo, the car rental company, and Outdoorsy, an RV rental company. The next two types of sharing economy jobs require your time, not your possessions. The first of these are low skill gig jobs. These come from companies like Uber, Lyft, Doordash, and Postmates. Typically, you’ll drive someone or pick up food in some capacity. There are also dog walking or laundry companies that require your time, but not a whole lot of skill. The final category of the sharing economy is high skill gig jobs. This requires some previous experience, say in a creative role or as a handyman. Companies like Fiverr and Upwork are popular freelancing sites, and companies like Taskrabbit or Thumbtack can pair people with mechanics, remodeling crews, or other types of skilled or manual labor. There are dozens of niche sites for whatever professional help you need. For the sake of this article, we’ll only consider those who use the high skill marketplaces as a gig site, not as another marketing opportunity for their business. This means that a mechanic who owns a shop but finds customers on Taskrabbit won’t be considered. In the same vein, professional freelancers who operate a successful business won’t figure into our study. Only those who really use Fiverr or Upwork as a gig site will count. So, is it possible to live off the sharing economy? Let’s figure out. 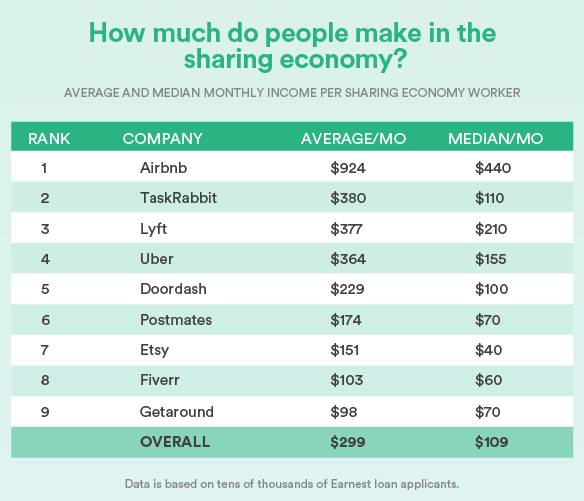 Here is an estimate of the mean and median monthly income for some of the top sharing economy jobs. You’ll notice that there can be a pretty wide gap, around 40-70%, between the average and the median. This is because of professionals using the platform. Say someone who owns five Airbnb properties or who drives Uber as a full-time job. The median is a better estimate for your typical Airbnb host. For our analysis, for jobs like Lyft, Uber, Doordash, and Postmates, the average is a better estimate because it might actually represent full-time work. Let’s make our monthly income assumptions right at the averages, though if we need to do a little of our own sleuthing, we will error on the low side. 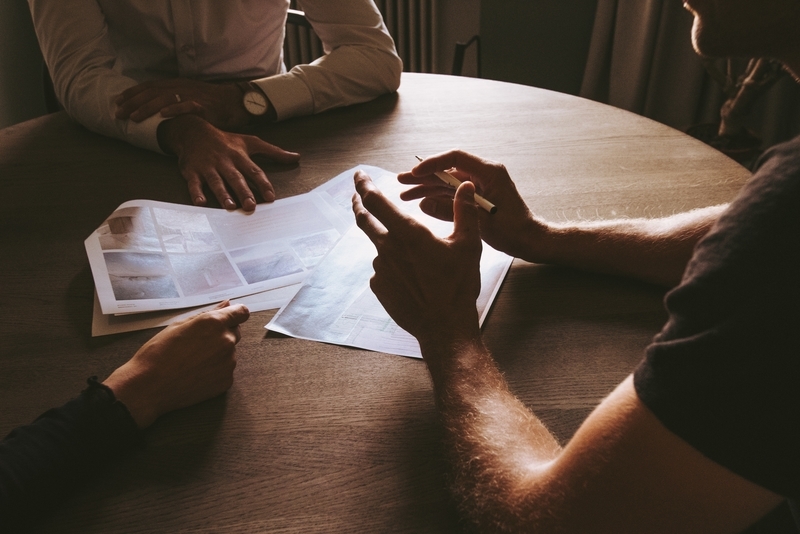 Many companies have income estimators, but of course, they’ll tend to estimate high as an incentive to get you to participate. The first and easiest job to help you live off the sharing economy is hosting with Airbnb and Neighbor. According to the graph above, a host could expect to make $440 a month on Airbnb. That’s a great start. 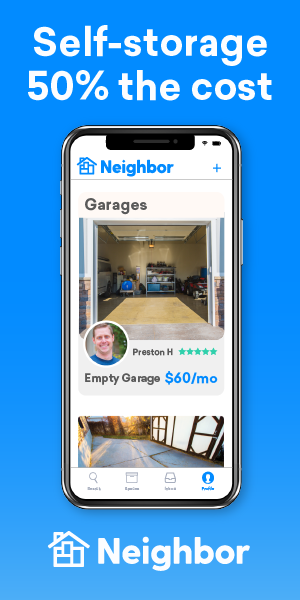 With Neighbor, the average host who is renting out a garage makes between $50-100 a month. While that’s a lot less than Airbnb, there’s also no work involved. The renter moves their stuff in, and that’s it. From Airbnb and Neighbor, a host could make around $500 a month. The next debate of how to live off the sharing economy is between the best way to use your car. Should you drive for Uber or Lyft? Should you pick up for Postmates or Doordash? And should you forget driving and just rent your car out on Turo? We’ll leave it up to you to dig into the best money makers, but from our research, it seems that most drivers, regardless of the platform, make around $8-10 an hour. Let’s estimate low at $8 an hour for those jobs. Depending on where you live, it may not be possible to get 40 hours a week with every ride share or delivery program. With Doordash, you’ll have more business around lunch and dinner hours, but maybe not in the mid-morning or mid-afternoon. At $8 an hour for $40 a week, and four weeks in a month, you could make $1,280 a month. That’s not bad, although it’s pretty much a minimum wage job. However, you’ll meet new people, get to choose your hours, and listen to a lot of music, books, or podcasts. This is a lot more than you could make with Turo, the car rental company. On Turo’s site, a 2013 Toyota Camry could bring in $432 a month. This is a US average estimate, and the real income will vary by city. If you’re going to use your car to make money full time, driving for deliveries is a better option. However, if deliveries aren’t your thing, Turo isn’t a bad way to go. Turo is an especially compelling option if you pair it with another low skill gig job that doesn’t require a car, such as Rover. It’s a little harder to find out how much a Rover dog sitter or walker makes. However, most people on the forums claim to make over $1000 a month full time. If you live in a big city, that number can more than double. Let’s be conservative and say $1000 a month. Choosing to work for Rover might free up your car, allowing you to double dip and make more money than you would as an Uber or Lyft driver. This makes it a little more possible to live off the sharing economy. 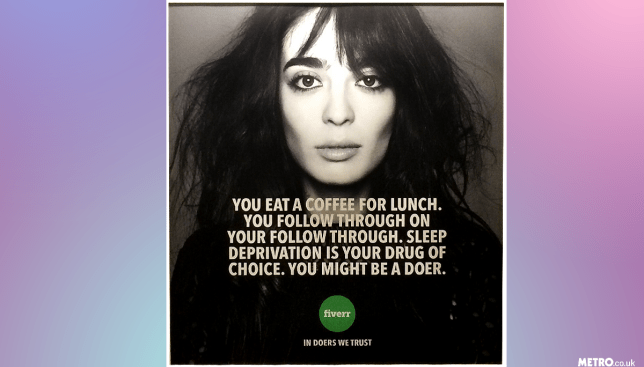 High Skill Sharing Economy Jobs – Worth it? Finally, what about high skill gig jobs? If you have mechanical, handyman experience, or creative design, writing, or marketing skills, you may be able to find gig work on freelance sites. The truth about Fiverr and Upwork is that people seeking talent there are often looking for cost-effective work. That is to say, it’s not a great money maker and you’re competing on a bid system, which can be a frustrating process. As the chart shows, the median Fiverr salary is only $60/month. Taskrabbit brings in a little bit more at a median of $110/month, although the average is much higher. If you work Taskrabbit, you set your own wages. This means that if you’re a pro and get a good reputation for your job, you could make a lot of cash. However, if you’re not fully committed to making Taskrabbit work, another sharing economy job could make you more with less effort. Chances are your opportunity cost is too high to go looking for sharing economy jobs. They can be a great way to market your business, you’ll have more success finding high paying clients elsewhere. 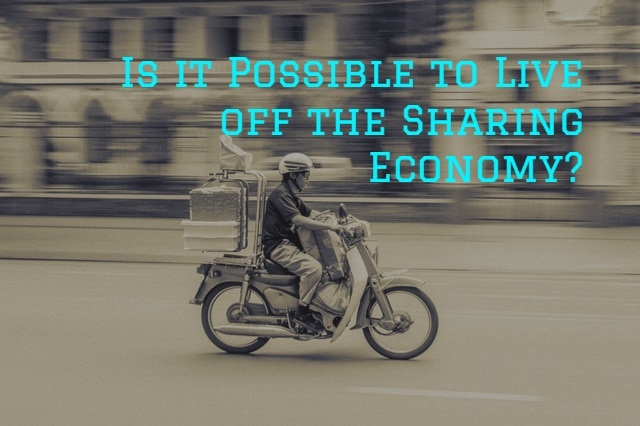 Is it Possible to Live off the Sharing Economy? 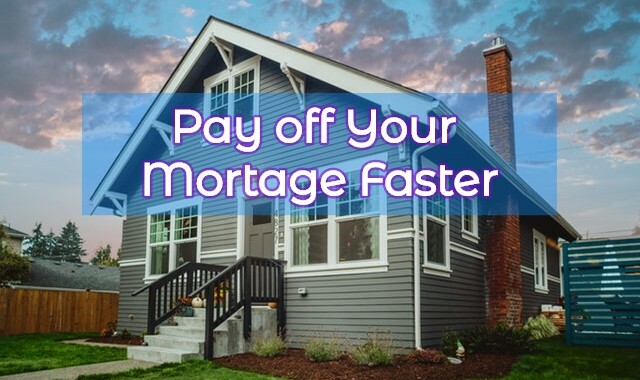 This combination, a solid rental property, a gig job that doesn’t require a car, and car renting, will bring in the most cash per month. All up, this is the equivalent to $12 a month or $24,960 a year before taxes, which as a gig worker, means paying a lot at the end of the year. It also doesn’t account for money spent on home or car maintenance. Nor do any of these jobs offer benefits or insurance. It seems that to live off the sharing economy, at least with the minimum Airbnb space, is barely possible and hardly ideal. At the same time, if you have a bigger home, the money you could make on Airbnb or Neighbor will grow quickly. Likewise, if you have a car to rent out and a car to drive, you could pick up more cash. Owning an RV could also make you a couple of hundred dollars a month. The best way to use the sharing economy is to also hold a full-time job and use your home to bring in the extra money. Airbnb and Neighbor can give you a little boost of cash to pay a mortgage or pay for little things on the side like a vacation. Miles is the content marketing manager at Neighbor. When he's not writing, he enjoys backpacking, snowshoeing, reading, and thrift shopping. 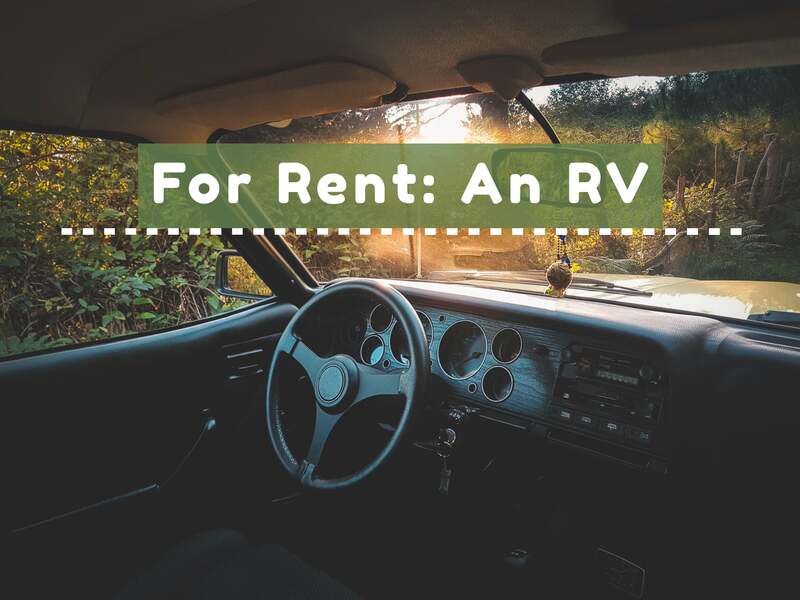 Is Renting Out Your RV Worth It?